It was so pretty outside today that I documented my home garden, mainly “The Farm” in back. Here are some pics of what’s in bloom today plus things that I’ll be harvesting in the future if the critters don’t get them first. 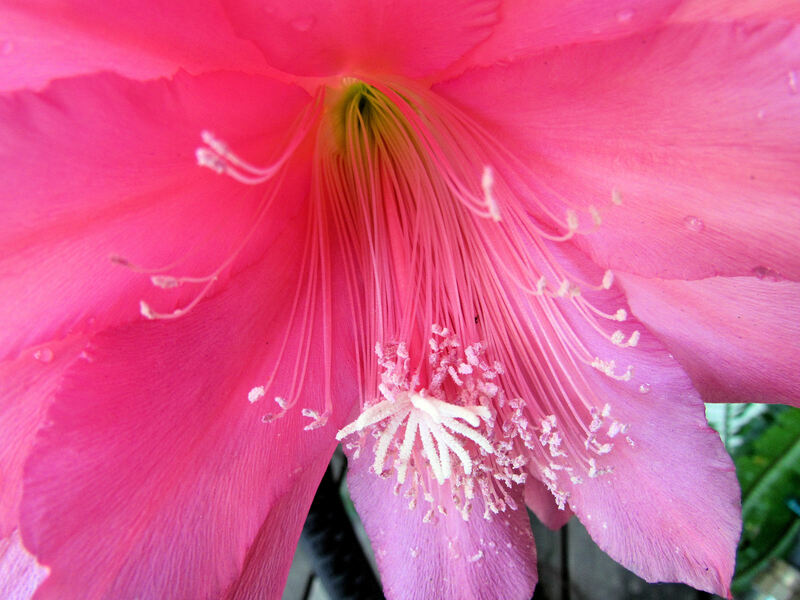 I love it when the orchid cactus are in bloom. This salmon one is larger than my palm. 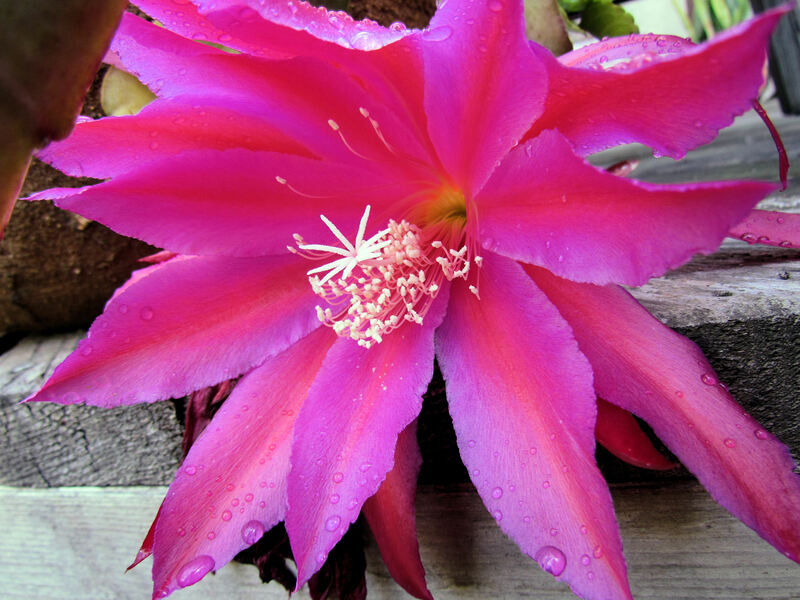 The red orchid cactus are beautiful too. 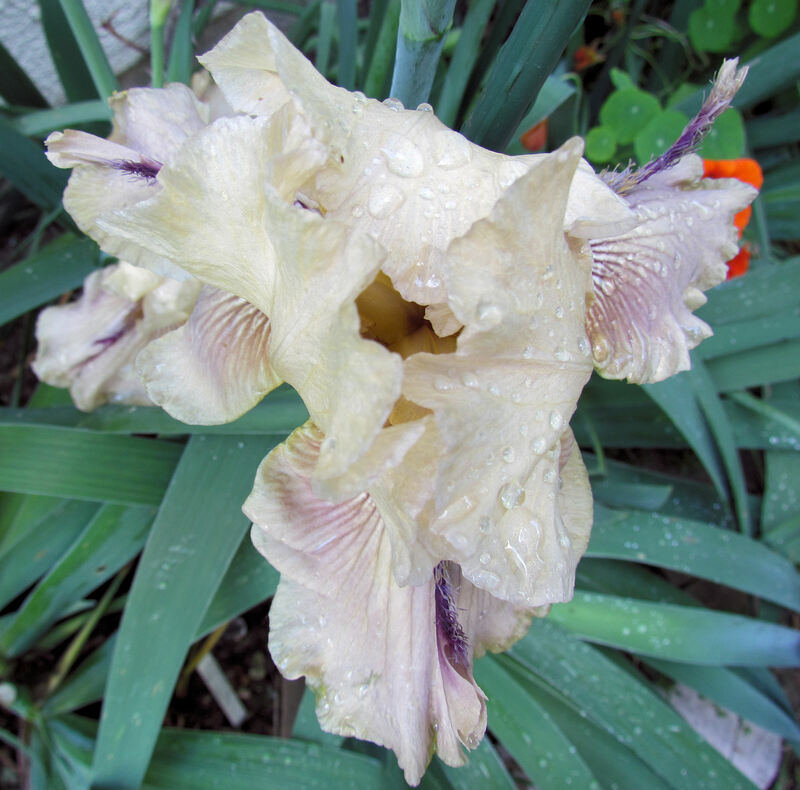 This "Thornbird" bearded iris is the second of my new iris to bloom. The colors are a bit muddy, but I like the tan and lavender. This one is a more prolific bloomer than "Clarence", which was a real beauty. 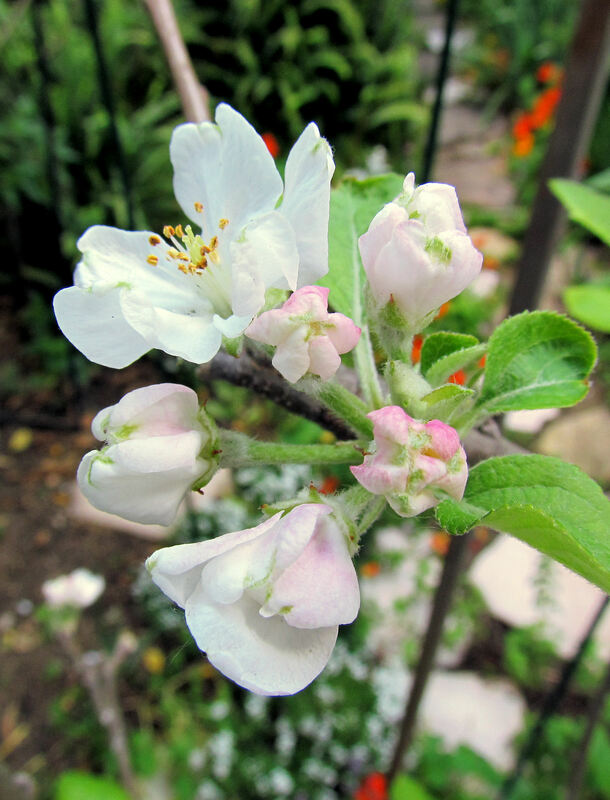 My dwarf Fuji apple tree has more blossoms on it than in the past three years, so I'm hoping for my first real crop of Fuji apples. My venerable dwarf Granny Smith apple tree has more blooms than it has ever had before, so I'm hoping for a good crop of apples this year. 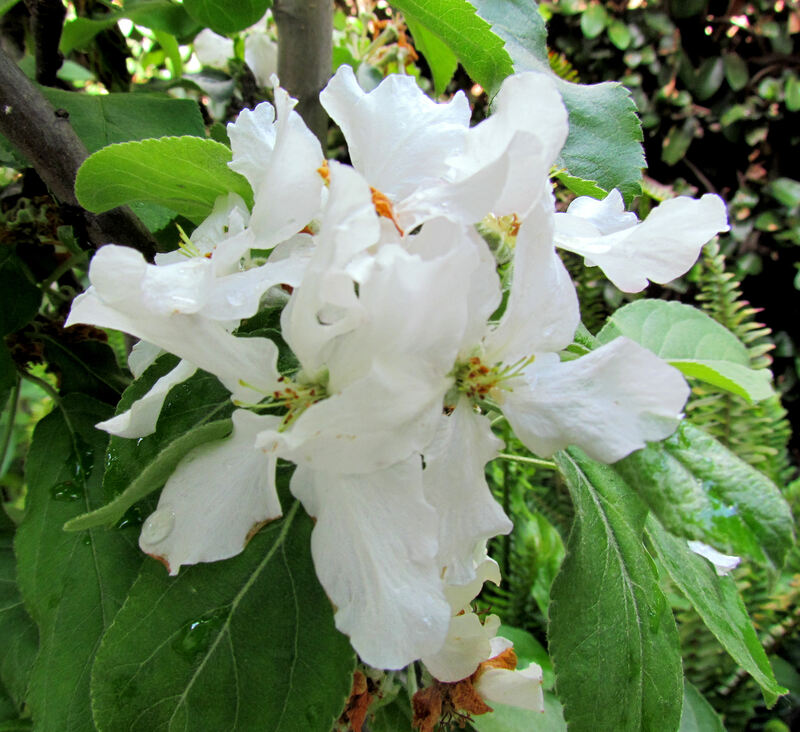 I may even get my first Gala apple since it is blooming too. 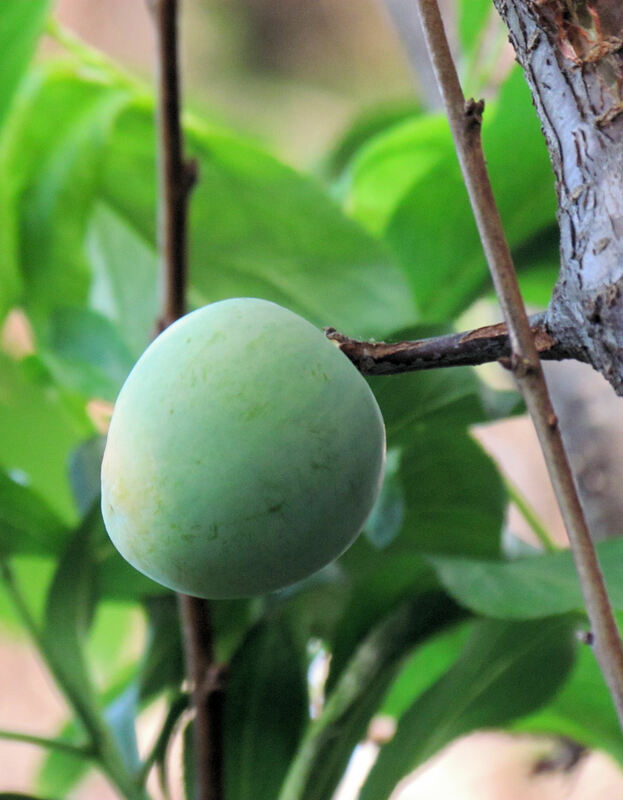 I'm racing the birds and night critters to get the Florida Prince peaches before they do. I have lots of peaches but they're really small this year. I should have thinned them I guess. By the back path behind the house I have my Fuji, Gala, and Granny Smith apple trees, plus a Santa Rosa plum, Florida Prince peach, and Red Flame grapes (which haven't made any grapes yet). 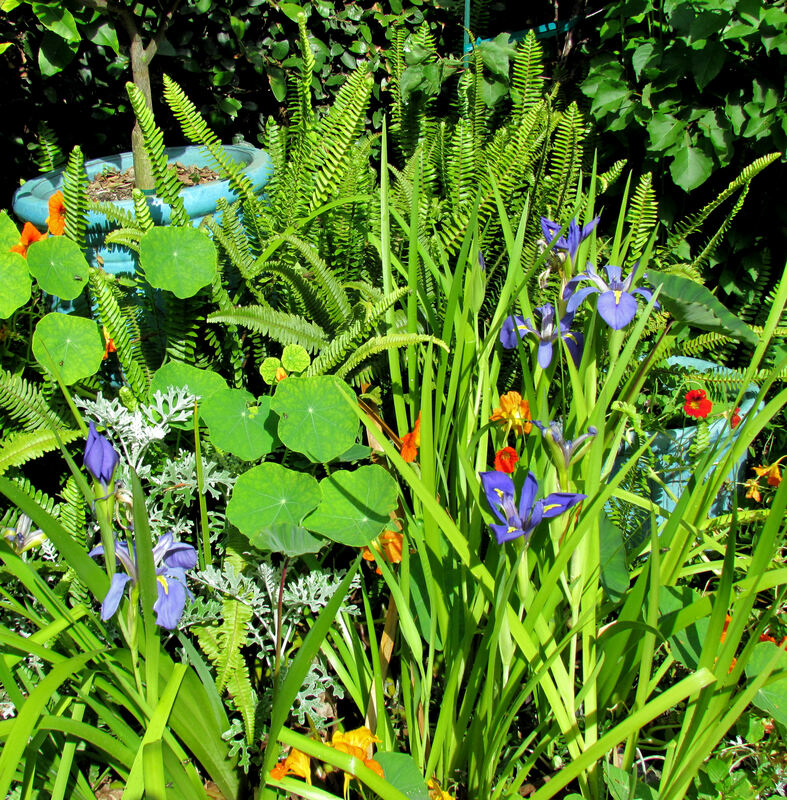 This is also where I have my irises and roses, plus a Cleveland Sage (California native for the humminbirds). The chicken coop is under the plum tree. 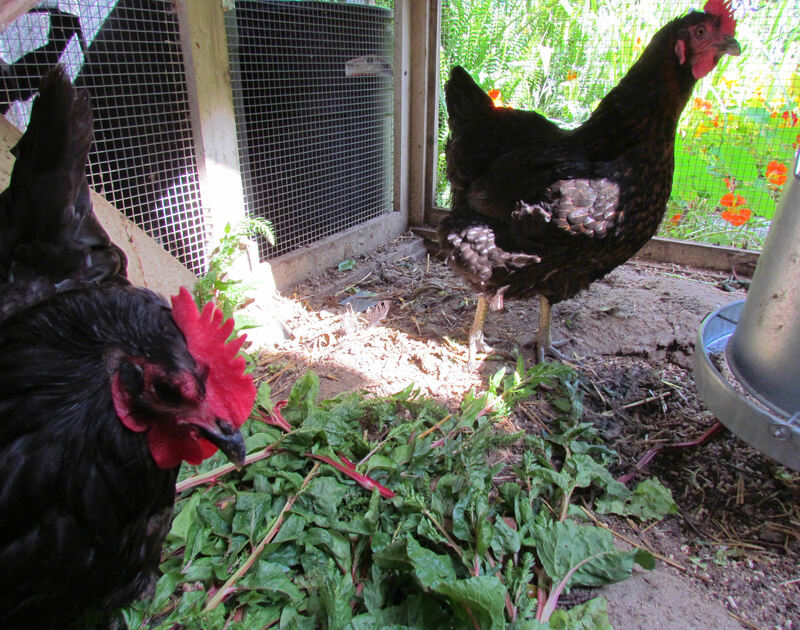 The hens are enjoying some chard stalks that went to seed. They get a LOT of greens. My little water garden in back is all filled in with plants. The irises are in bloom now. Maybe the water hyacinths will bloom later. 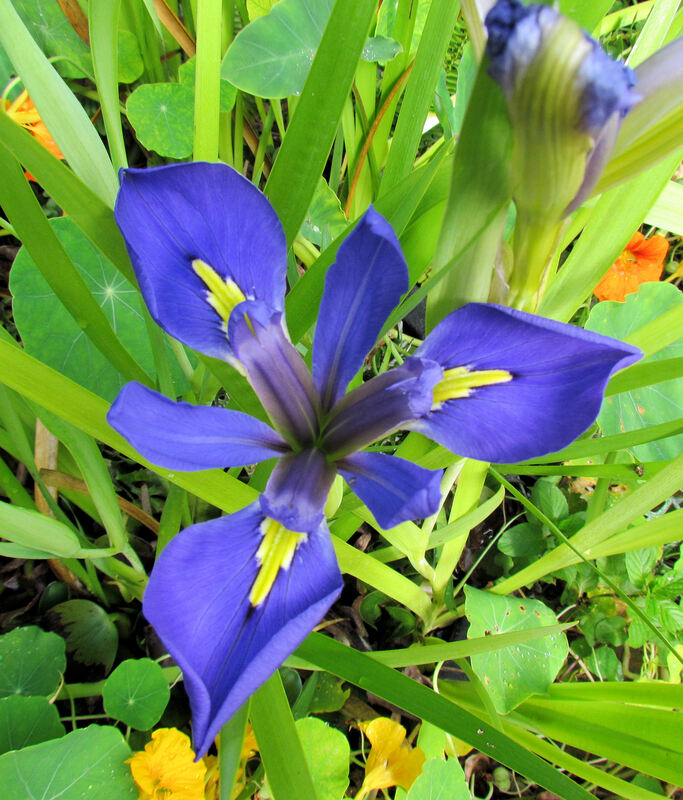 I don't know the name of the irises that grow in my water garden. They look like Japanese irises, but maybe they're called something else. 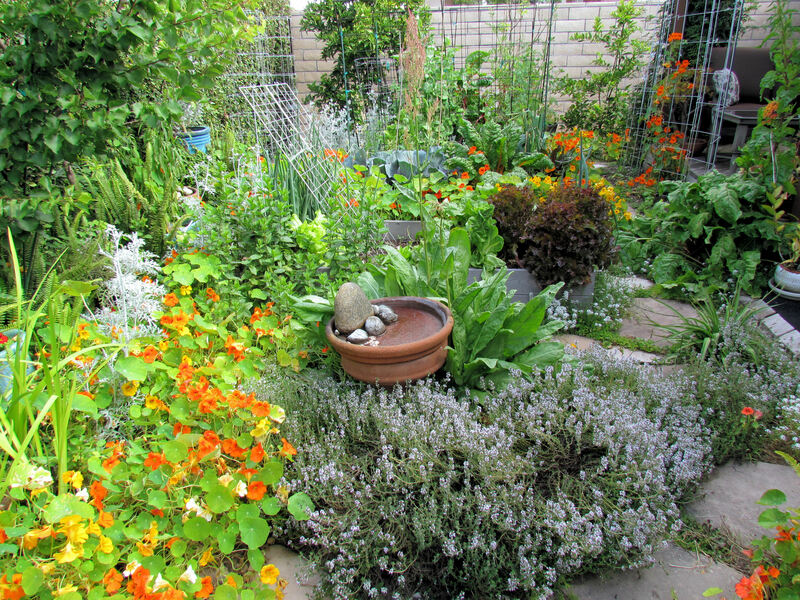 My three raised beds of vegetables have an herb garden in the foreground, and are surrounded by nasturtiums and fruit trees. 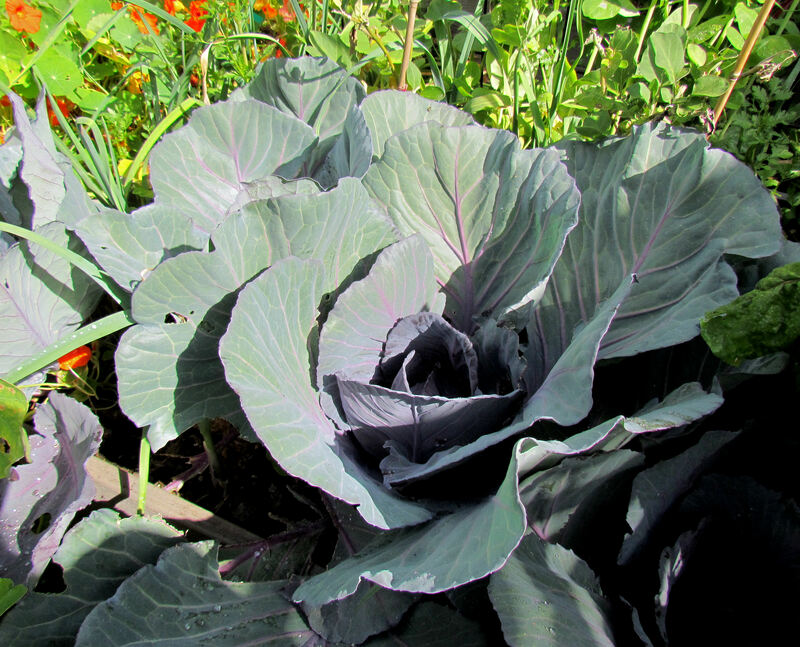 The red cabbage seems to be heading up nicely. I am hoping for a cabbage harvest in a few weeks. 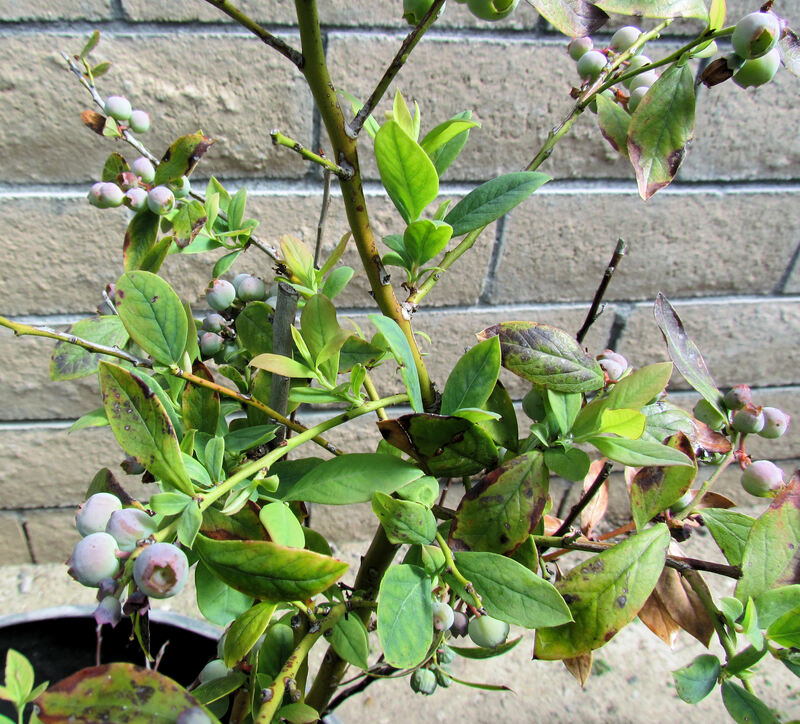 The blueberries are nearing ripeness. We have orioles in the neighborhood, so it will be a race to see who gets to the berries first. Construction of the new block wall on the north has given my lime tree more sunlight. The old wooden fence was falling over onto the lime tree and the poor thing has never given me any limes. This year will be different. 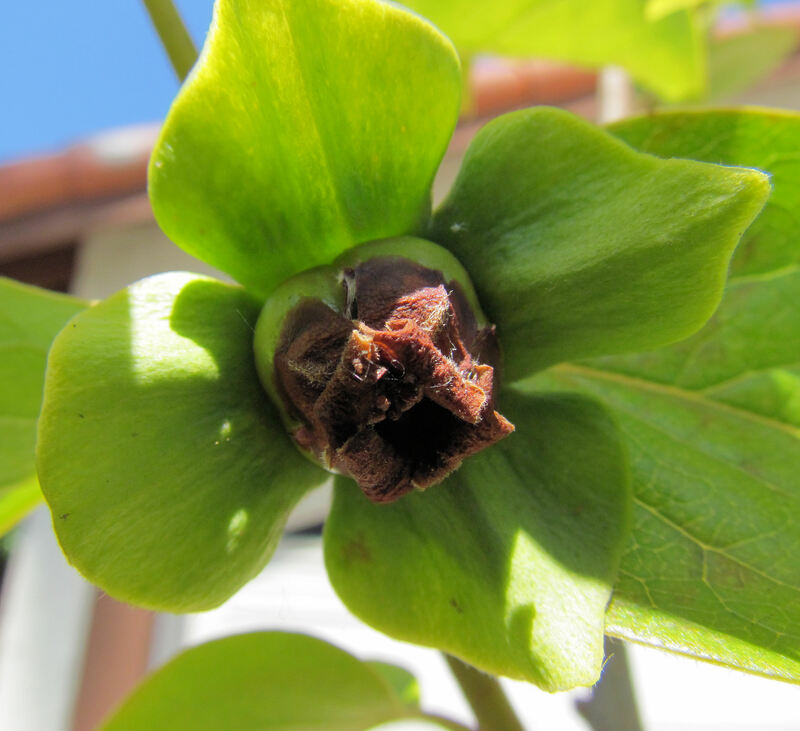 This is just one of the little limes that have set fruit and the tree is still blooming. I bought two nice bean towers from Gardener's Supply Company. 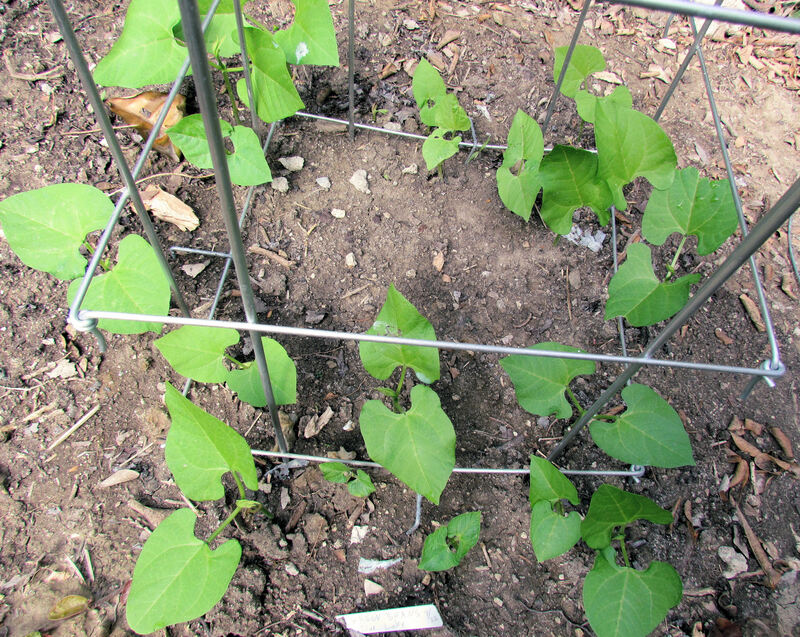 Blue Lake pole beans (seen here) are growing up one and Kentucky Blue pole beans (a new variety for me) are growing up the other. I like these space-saving towers so much that I may get another. 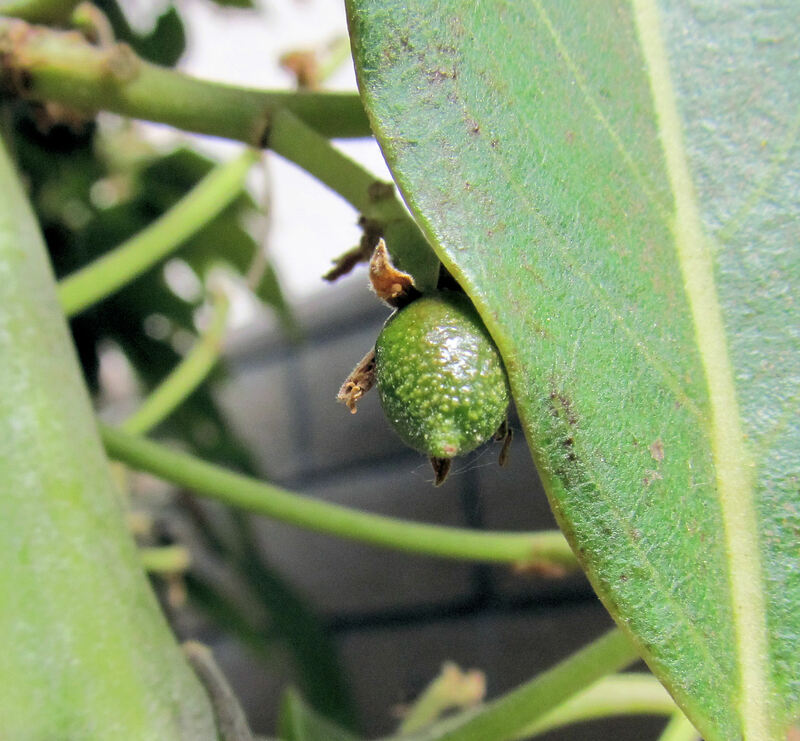 This is the season for teeny tiny avocados, most of which usually fall off the tree. 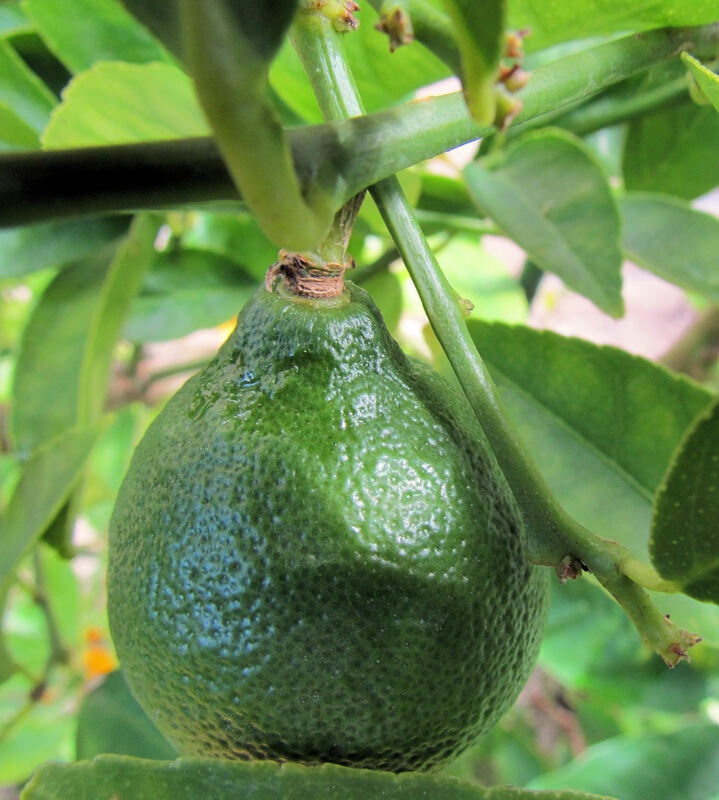 Every year I say that I'm going to cut down that worthless avocado and every year I don't because I hope that it will set some fruit. Maybe the new block wall will result in it getting more sunshine and setting more fruit. I keep hoping. 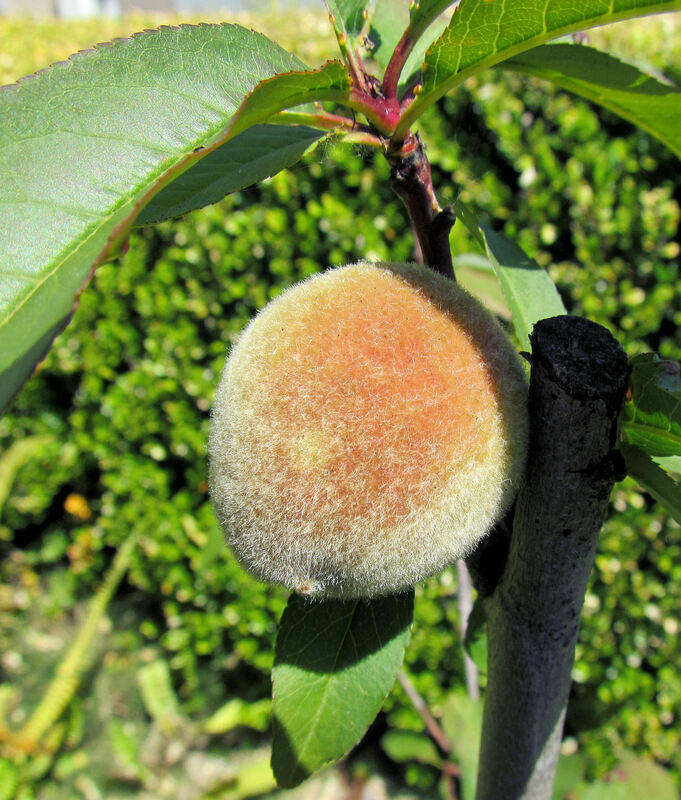 The Katy apricot tree has set more fruit than usual, which makes up for the peach, nectarine and plum trees, which are pretty bare this year. 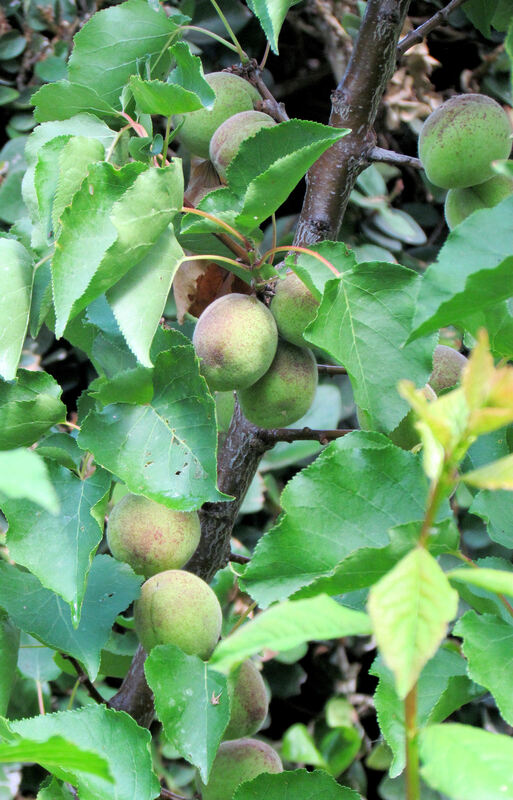 I don't think I have even six plums on the Santa Rosa plum tree, but they're getting to be good size. I have only two Snow Queen nectarines (one shown here), and maybe a half dozen Panamint nectarines. 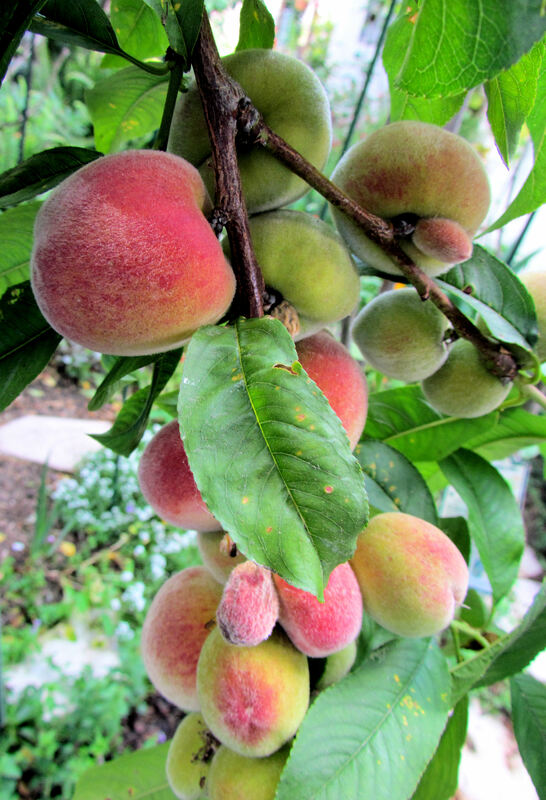 The August Pride peach tree has only a couple of peaches on it and a few more on the Babcock Improved peach. Not a good year for the late peaches. 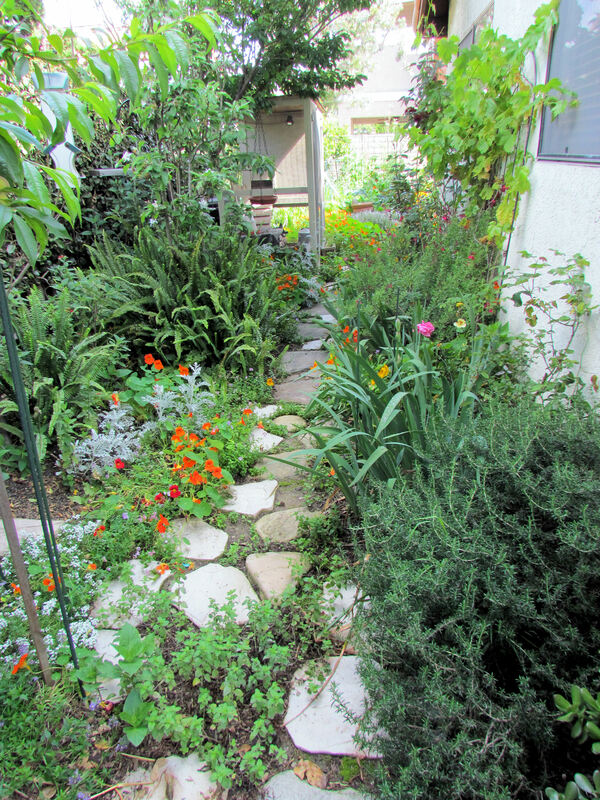 One of the advantages of an all organic yard is that it's safe for birds, bees and butterflies. 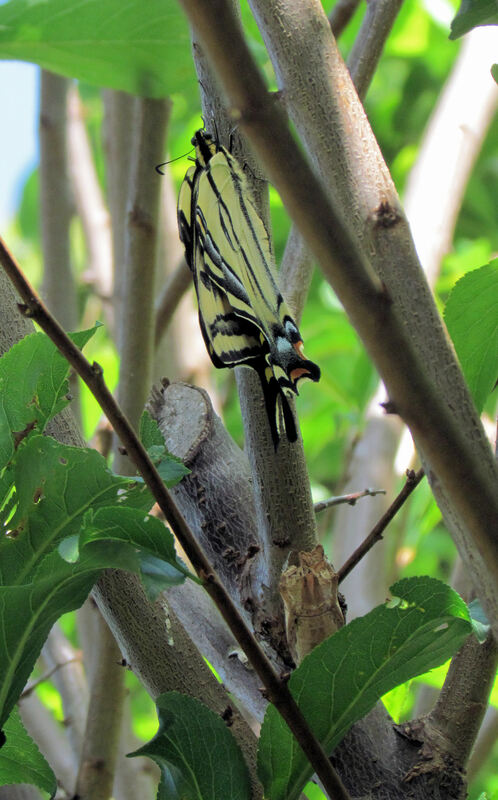 I was surprised to find this swallowtail butterfly that had just emerged from its cocoon (or chrysalis?) in the plum tree today. 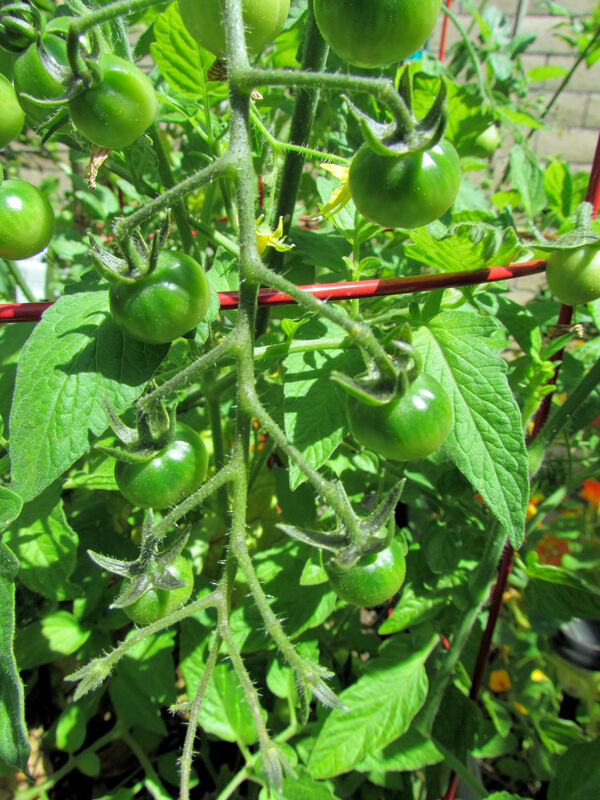 This Sweet 100 cherry tomato is producing ripe tomatoes already. And boy are they sweet. Our semi-dwarf navel orange bloomed twice last year. This is one of the later oranges that is ripening now. 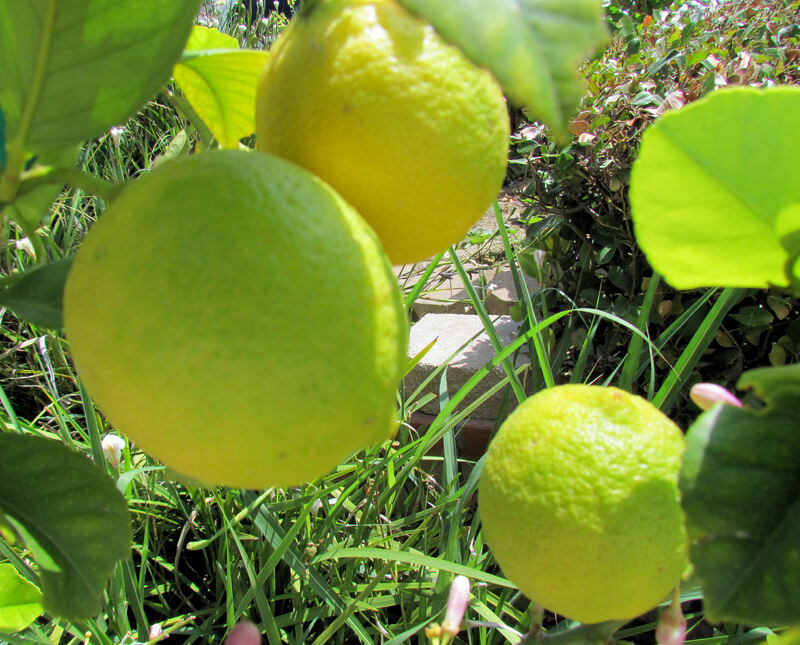 I have three dwarf Eureka lemons. This tree is producing, but the other two aren't doing much. 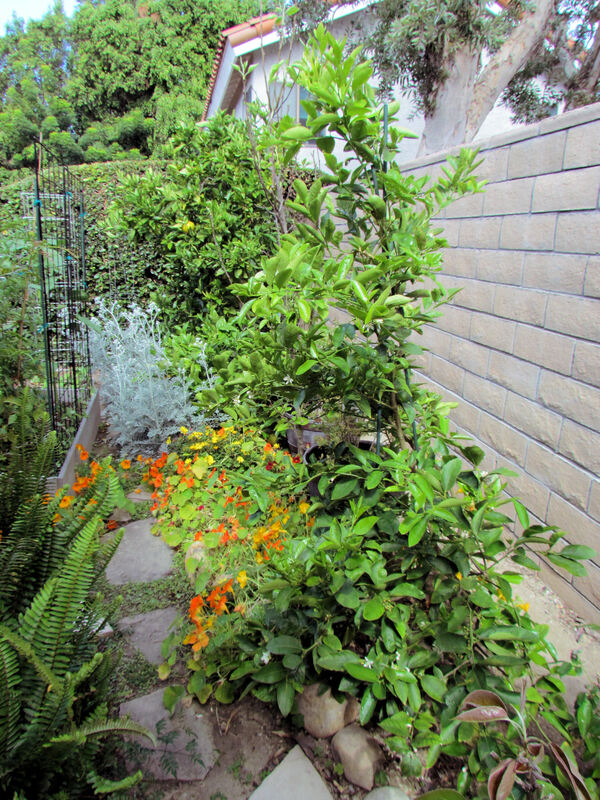 They seem to take turns, so it's good to have three trees plus the Meyer lemon. 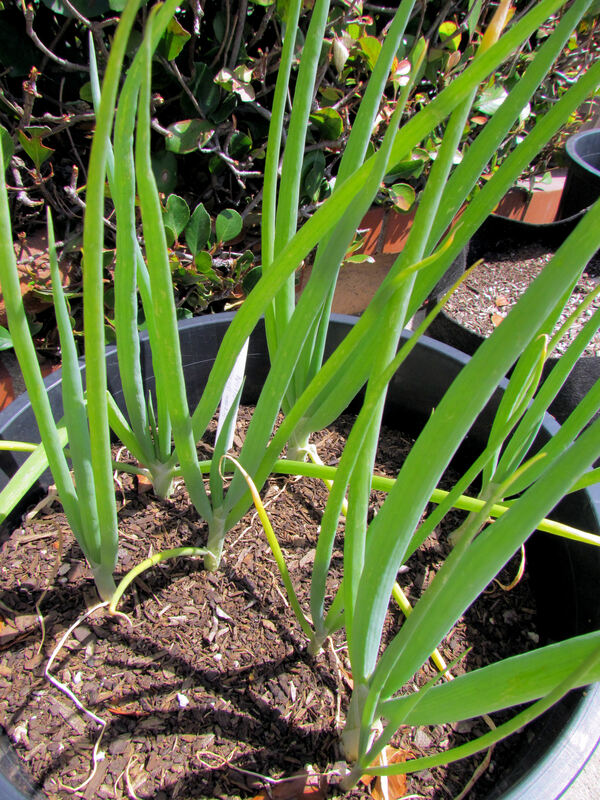 I sowed green bunching onions a bit too thickly earlier in the year. I kept them all, spreading them out in various pots. I ended up with 110 green onions, many of which have been eaten by now. 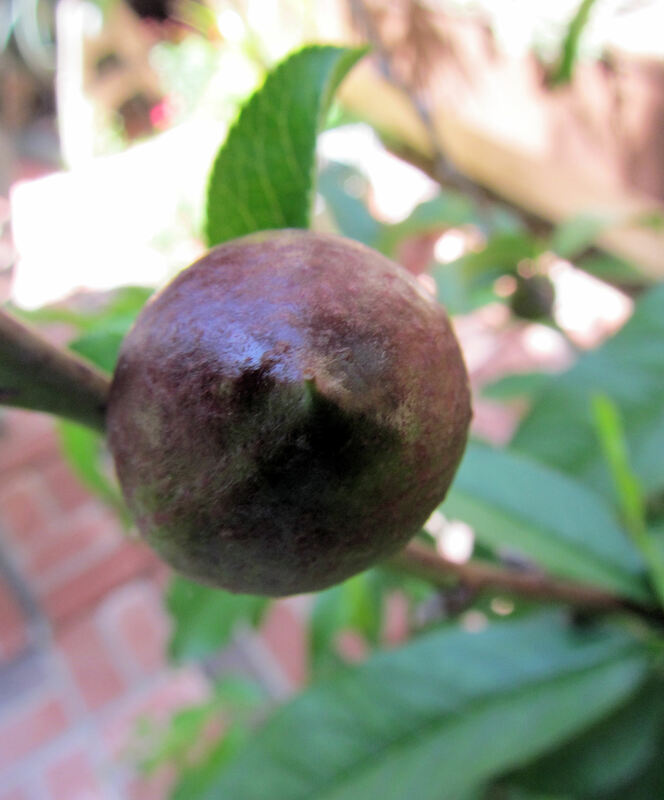 The lone Fuyu persimmon on my new tree may actually be fertilized. It's looking promising. 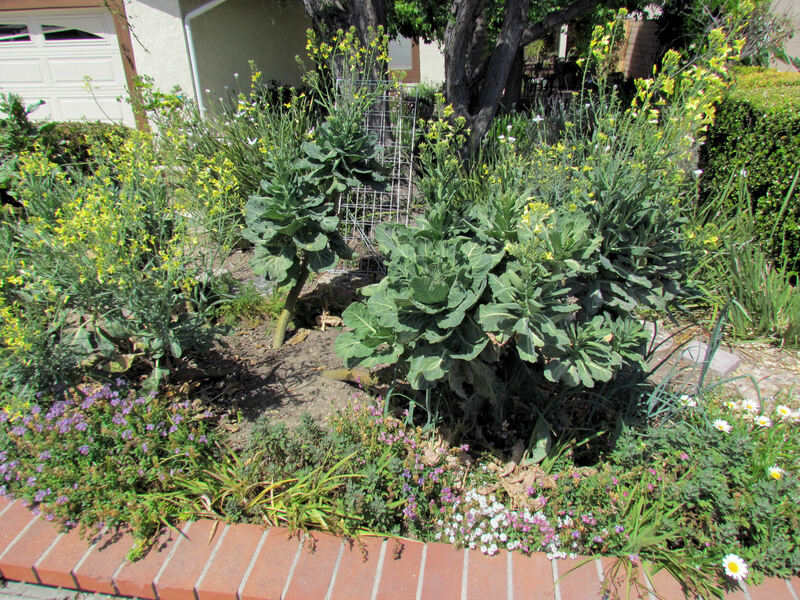 The Garden of Infinite Neglect is looking neglected as usual, with kale, collards and chard going to seed. 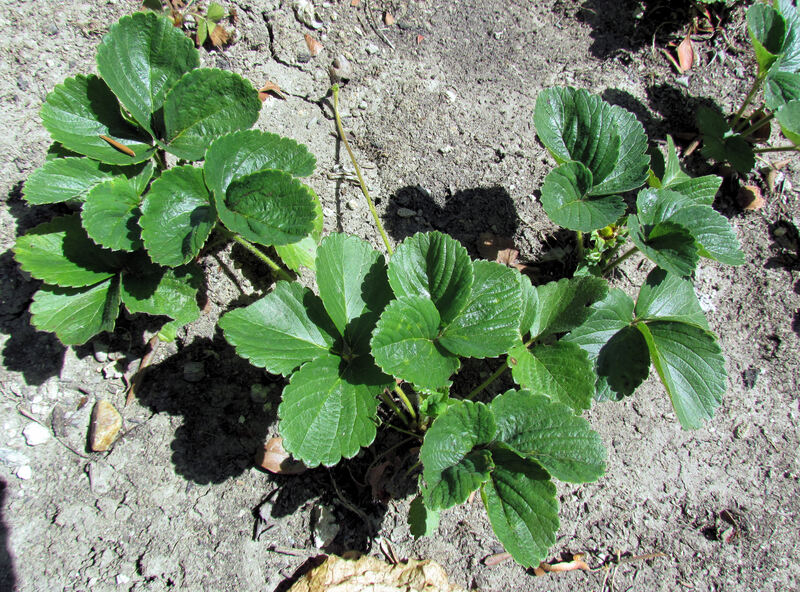 I have a dozen strawberry plants in the Garden of Infinite Neglect that may or may not give us some berries. They're sending out runners, so at least we'll get new plants. 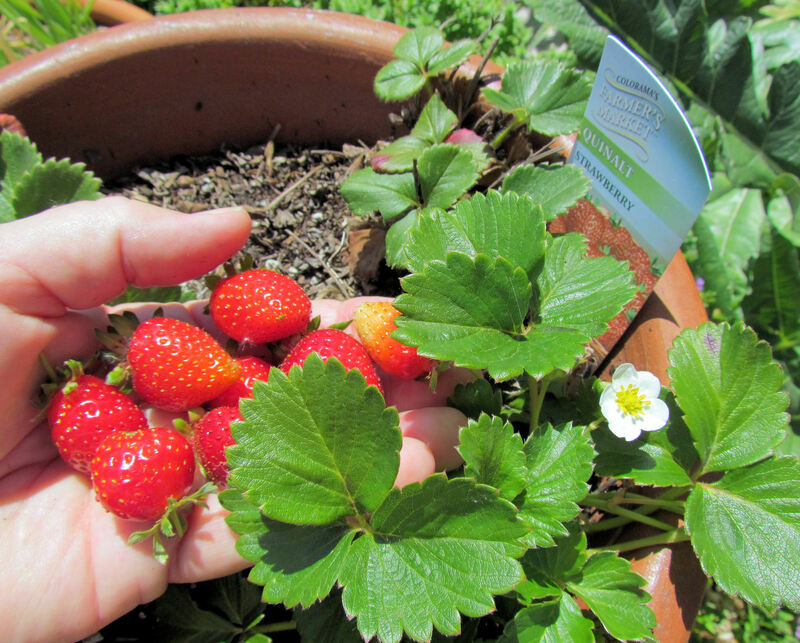 The only strawberries I'm harvesting are from my strawberry pot. 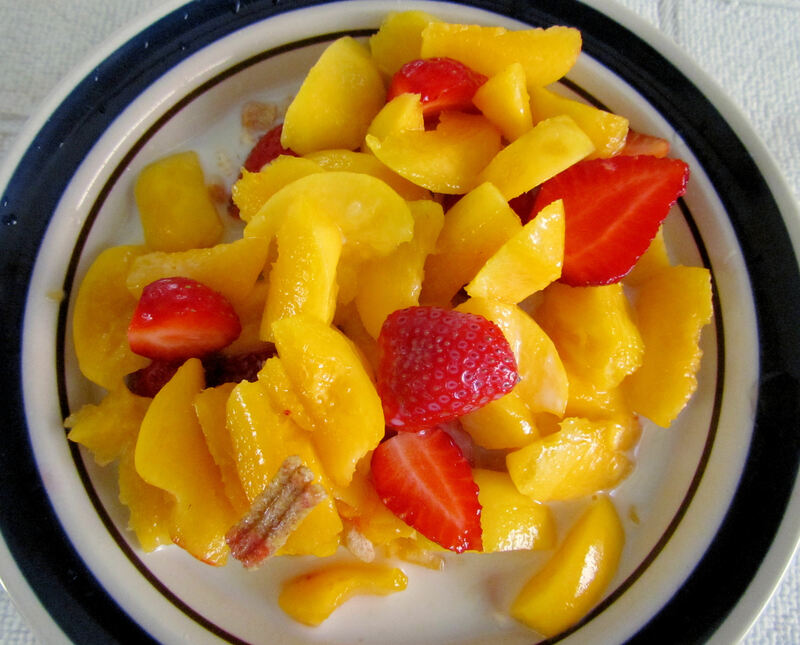 I had strawberries and peaches from the garden on my cereal this morning. 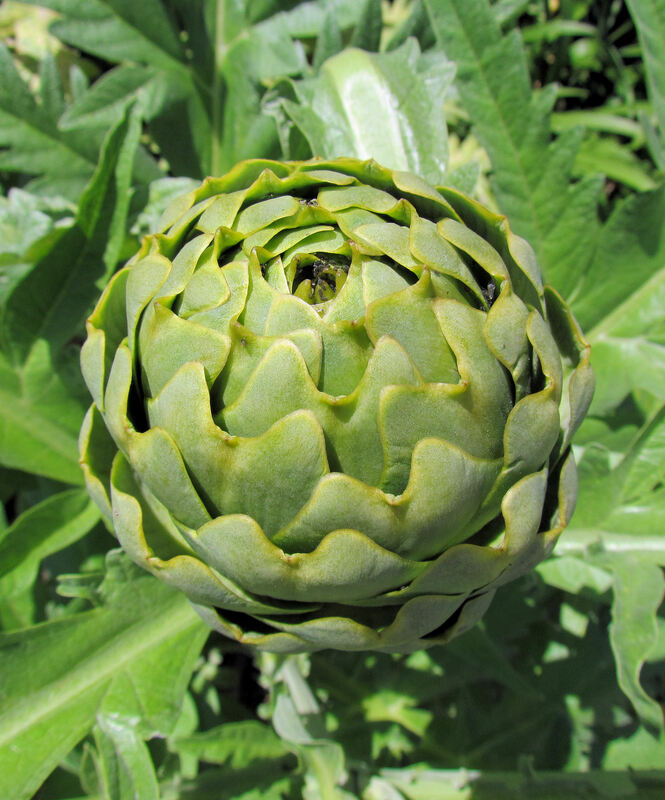 The artichokes are coming as fast as we can eat them. I had two for dinner tonight. 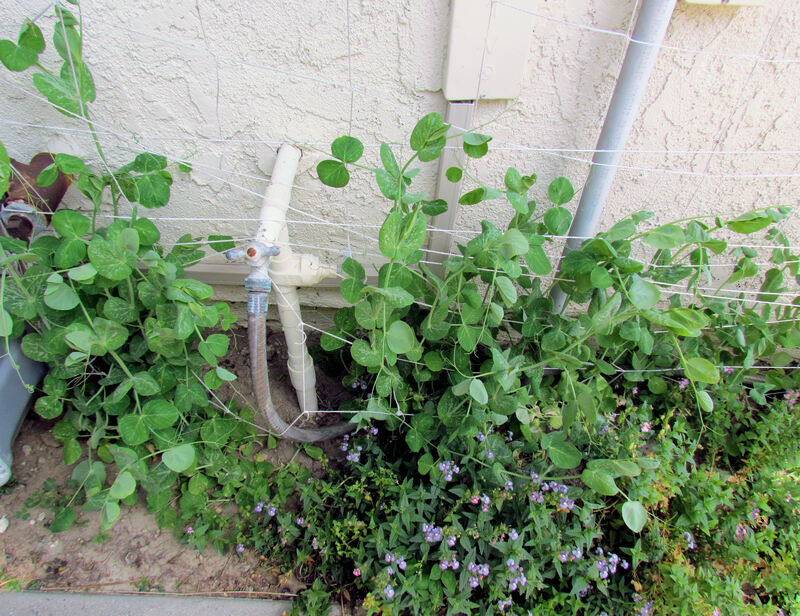 Snow peas are growing up a pea fence by the water meter. I make use of every square inch of ground. 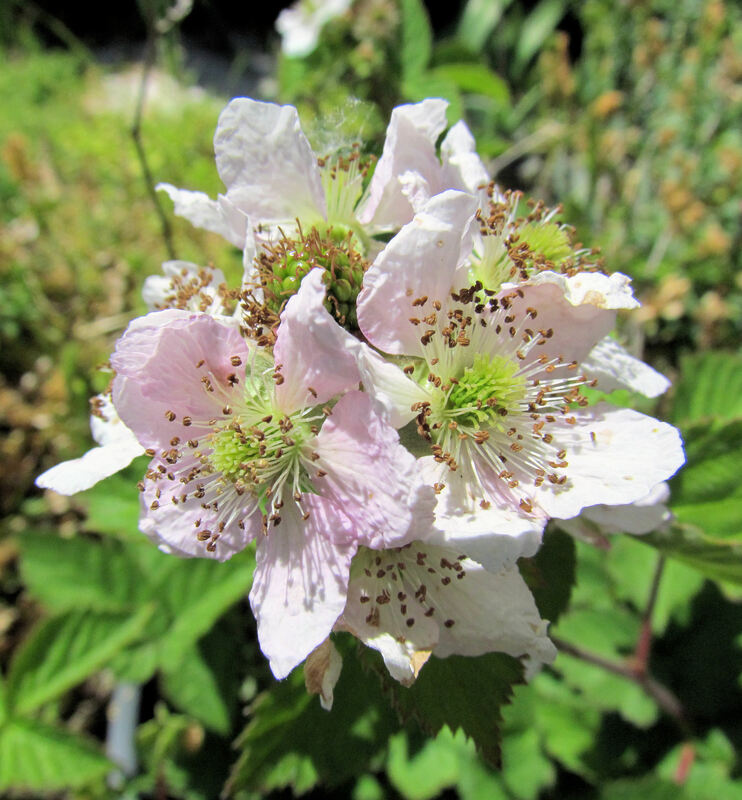 These are the best flowers yet on the thornless blackberries, at least on one of the plants. The other plant is looking pretty miserable. 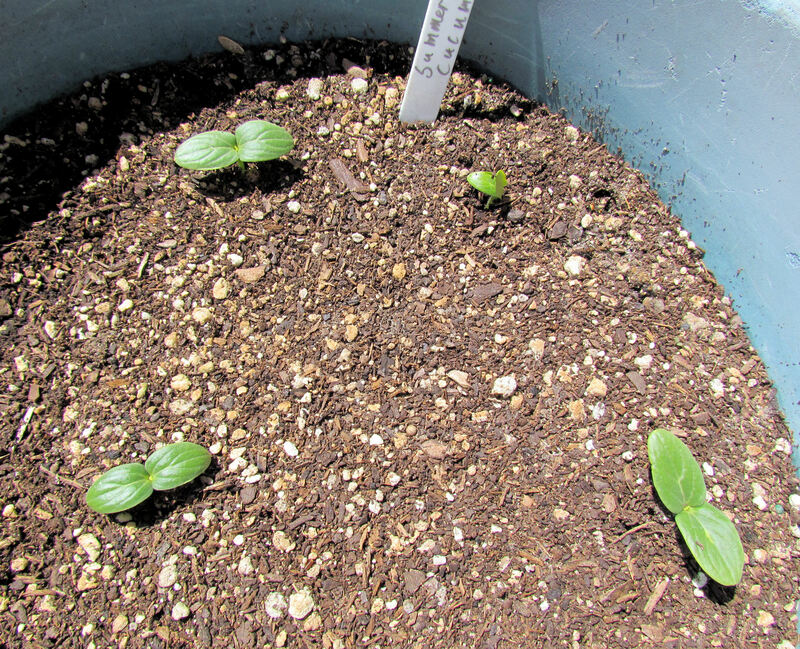 I'm growing these Summertop Japanese burpless cucumbers in pots. I have some Tendergreen Japanese burpless cucumbers growing up a new cucumber trellis in back. Most of the front yard is planted in flowers. Pink Mexican poppies are in bloom now. Hope you enjoyed this tour of our yard and garden in early May. This entry was posted in Uncategorized and tagged apples, backyard chickens, flowers, Fruit, Gardener's Supply Company, green beans, photos, raised beds, vegetable garden, water garden. Bookmark the permalink. we have a lot of the same fruit trees and shrubs but opposite sets even though were in the same city. Weird. My peaches and nectarines did well but my apricots… not so good. I did a lot of hand pollination with my stone fruits thought. If you have time next year try it out. I just use a q tip. Oh, my, I can’t imagine hand pollinating my stone fruits. I do that with my winter squash and pumpkins though. Very strange that you are having the opposite results with your stone fruits. I wonder if it has to do with the age of the trees. They’re supposed to bear more heavily every other year. 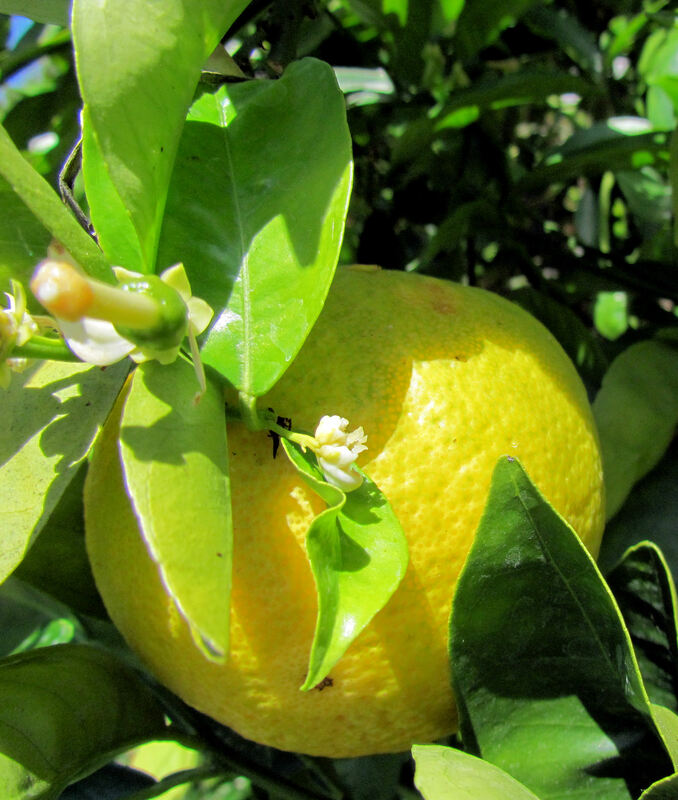 I always get so jealous when I hear of all the citrus fruit the warmer climes get. I love citrus. But then come November I’m really happy as I usually want a garden break. Ah, Daphne, if you were out here you’d be planting your winter crops in November. We don’t get a break, we get variety. Thanks, Kathy. I agree, mine look like Iris hexagona, the Louisiana iris. I can’t find mexican poppy seeds. Your picture of your front yard has the variety im looking for. Do you save and see your seeds?? 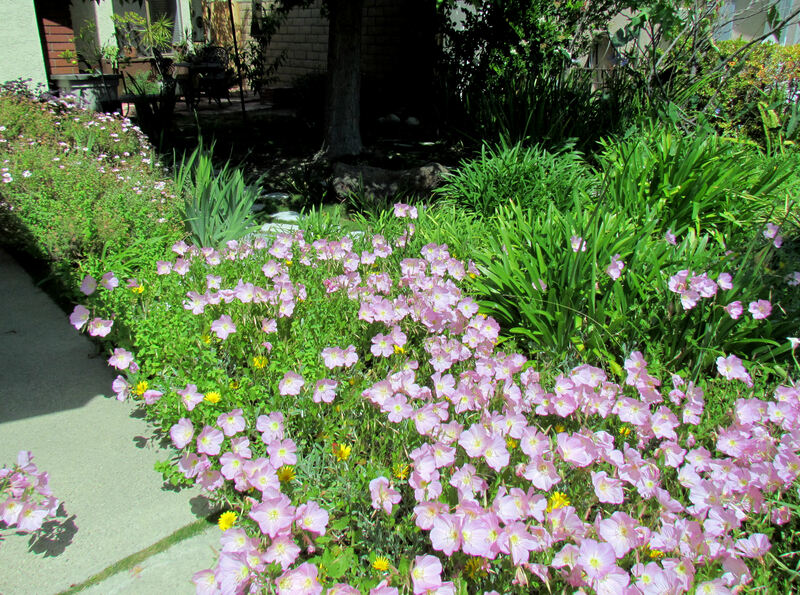 The pink flowers in my yard are Mexican primrose. I have been calling them Mexican poppies mistakenly. I bought them as a six-pack of plants, and they have reseeded themselves nicely. I don’t save seeds from them deliberately.